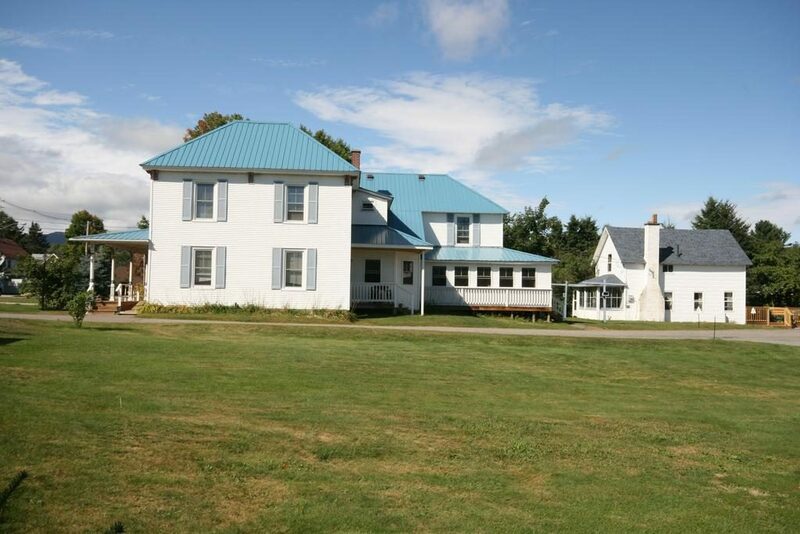 The Main House at Spruce Lodge is a Bed and Breakfast which is defined as a guest house or small hotel offering sleeping accommodations and a morning meal. The Main House is over 100 years old and is sprinkled with memorabilia, antiques, and family heirlooms. Through the front door you enter our reception and common sitting room where you will find the guests’ tv, games, toys and children’s books. Our mission at Spruce Lodge is to offer a clean cozy guest house with reasonable rates so our guests can enjoy other activities that Lake Placid and surrouding areas have to offer. Sleeps up to 4 persons. Includes bedroom with queen bed, double futon in living room, private bath, kitchenette, and TV. Rates start at $65. Breakfast is included. The Stripe Room looks out over the large yard and has a beautiful hand painted mural on the wall. The room includes an adjacent private bath located just outside of the bedroom. Please check policies for more details on room, cancellation policy, etc. The Sunflower Room faces westerly and gets some great evening sunlight shining in. Tucked away in the corner of the Main House, a cute little private hallway opens up to a sunshine yellow room with a double bed and private bath with shower. Please check policies for more details on room, cancellation policy, etc. Rates start at $75. Breakfast is included. The Pinecone Suite is located on the main floor of the lodge and has its own entrance off the main porch. The suite has two well-appointed rooms and a full bath with shower. The main bedroom features a queen size bed and pinecone decor. The second bedroom is accessed through the glass-paned french doors and features a twin/full bunk bed with a separate entrance. There is plenty of closet space to stow away your luggage for longer stays and enough room to spread out your yoga mat and engage in downward dog. Please check policies for more details on room, cancellation policy, etc. The Lilac Room is located on the second floor of the Main House and features a full size bed and a twin bed. A large wardrober provides closet space and antique furnishings accent the room. The room includes a private bath with shower and wood floors throughout. Please check policies for more details on room, cancellation policy, etc. The Americana Room is located on the second floor of the Main House and features a full size bed and framed photos of family and area athletes. The room includes an adjacent private bath located just outside of the bedroom. Please check policies for more details on room, cancellation policy, etc. The Sleigh Bedroom is located on the main floor of the lodge right off of the dining room. You will find an expansive room with a queen bed and love seat for lounging around. There is plenty of floor space to do your morning calisthenics and a private deck to enjoy coffee or some light reading. The room includes a private bath with shower and a pack ‘n play is available if you are traveling with a little one. Please check policies for more details on room, cancellation policy, etc. The Adirondack Room is tucked away on the second floor of the Main House. After winding through a cozy corridor, The Adirondack Room greets you with a handcrafted twig canopy bed and a set of twin bunk beds. A rustic rocking chair and Adirondack-themed decor complete the look and make you feel at home here in the Adirondacks. Please check policies for more details on room, cancellation policy, etc.